Cheesecake Brownie - Takes 5 minutes to throw together! - Let the Baking Begin! Cheesecake Brownie is a delicious fudgy brownie topped with slightly tangy cheesecake that takes 5 minutes to throw together. This easy brownie recipe will become your favorite in no time! I am super excited about the recipe I’m here to share with you. Originally I was trying to re-create a brownie that I like to get from my favorite coffee place. Somehow by doing tons of research on the ingredients, then studying the texture of the brownie I got exactly what I was looking for! I was so stoked when I tried them, that I kind of texted and snapchatted all my girlfriends, telling them that they just have to make these! My family is not too big on the whole pumpkin thing, so for Thanksgiving we just make our favorite desserts, which might not be very traditional, but hey, it works for us, ha! So, with the big holiday being next week, guess what I’ll be making ;)? 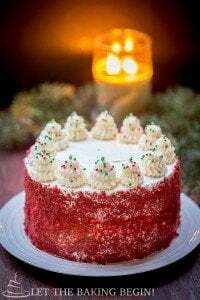 As we head into the binge-eating season (aka Thanksgiving, Christmas, New Years), we have to be at least a bit conscious about the sugar intake, or we can predict our New Year’s resolutions right now. With this in mind, I replaced all added sugar in the recipe with SPLENDA® Naturals Stevia Sweetener. The great-tasting, no calorie natural sweetener is made with stevia extract and gets its sweetness from Reb D, which means no funky aftertaste in whatever you use it in. Another great thing about SPLENDA®, is that they use no added flavors or colors, no preservatives and only non-GMO ingredients in their sweetener. By the way, you can visit their website to get more recipes made with Splenda. Here’s a little story – After a couple of consecutive successful batches of these Cheesecake Brownies, I was ready to take pictures and post them to the blog. I baked and cooled them, then let my family try a couple of bars and instructed them not to eat the rest as I was going to take pictures of them the next day. Next day I was too busy with school, so by the time I came back from school, the glass baking dish was empty :(. I whipped up another batch, let it cool again, this time I covered and hid the Cheesecake Brownies, as not to tempt anyone. Guess what I found when I came back home from school again? Yep, you guessed it. My faithful testers ate most of them once again, not leaving me much to take pictures of. No brownies, but many, many compliments about how good they were. My husband said that if I was to sell these, I would become an instant millionaire and since he doesn’t throw words like that around often, I was even more excited that, I wasn’t the only one who thought that these brownies were awesome! Moral of the story, when you do decide to make these Cheesecake Brownies, make sure to double the recipe! Pour 1 cup boiling hot heavy cream over 2 cups of milk chocolate chips. Let sit for 1-2 minutes, then whisk until smooth. Add 1 egg, 1 teaspoon of vanilla extract and whisk until smooth. Now add 1/3 cups flour and 1/4 teaspoons of baking powder and whisk again just until combined. Set aside. Combine 1 egg yolk, 1/2 cup cream cheese, 1 teaspoon vanilla extract and 2-3 packets of SPLENDA® Naturals Stevia Sweetener – whisk until smooth. Add 2 tablespoons of heavy cream and whisk again. Drape a ziplock bag over a glass and fill it with the cheesecake filling. Seal the ziplock. Pour the brownie batter into a pre-greased 8×8 (inches) glass or metal baking pan. Snip off the end of the ziplock bag with the cheesecake filling and pour zigzags of cheesecake over the brownie batter. Then using a fork or a knife go across the zigzags and swirl the cheesecake filling into the brownie batter. Sprinkle 1/4 cup or less of dark chocolate chips on top. Bake in a preheated to 350F oven for about 30-35 minutes, turning the baking pan halfway through. Once baked, remove from the oven and allow to cool to room temperature before slicing. Slice into 9 equal squares and serve. Cheesecake brownies can be frozen for up to 2 weeks, if wrapped well. What do you guys make for Thanksgiving dessert? Do you stick to the traditional stuff or make something else? 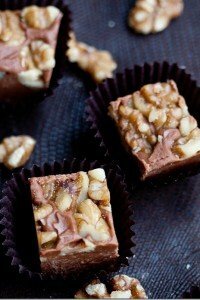 Chocolate Walnut Brownie Recipe – A classic brownie recipe with walnuts. Cranberry Bliss Bars – Soft coffee cake with white chocolate and dried cranberries. 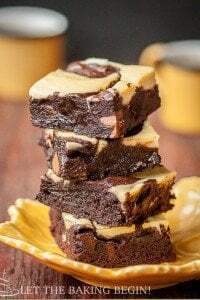 Chocolate Caramel Brownie – Simple chocolate brownies with caramel. Cheesecake Brownie - delicious fudgy brownie topped with slightly tangy cheesecake that takes 5 minutes to throw together. Combine 1 egg yolk, 1/2 cup cream cheese, 1 teaspoon vanilla extract and 2-3 packets of SPLENDA® Naturals Stevia Sweetener - whisk until smooth. Add 2 tablespoons of heavy cream and whisk again. Drape a ziplock bag over a glass and fill it with the cheesecake filling. Seal the ziplock. Pour the brownie batter into a pre-greased 8x8 (inches) glass or metal baking pan. Snip off the end of the ziplock bag with the cheesecake filling and pour zigzags of cheesecake over the brownie batter. Then using a fork or a knife go across the zigzags and swirl the cheesecake filling into the brownie batter. Sprinkle 1/4 cup or less of dark chocolate chips on top. Once baked, remove from the oven and allow to cool to room temperature before slicing. Slice into 9-16 pcs pieces and serve. Also, all you Walnut Lovers check out the Chocolate Walnut Brownie! Thank you for posting them for us! Hi Kseniya, that’s the greatest compliment I can get! Thank you so much for using my recipes and for sharing your feedback with the star review! Oh great ! I have seen the photos on Pinterest. Great work. Great idea ! 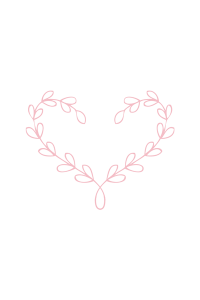 Thank you and have a nice weekend ! thanks so much for such great feedback! 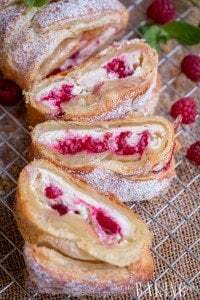 I’m hoping you already made them, how did you like these compared to the other recipe? We all loved these, and they were approved! These were soo soft, chewy and just melted in your mouth. They were heaven! I surely liked this recipe better! I will always be using this recipe from now on, thank you Marinochka!!!! I was salivating when I was looking at your pictures of brownies. 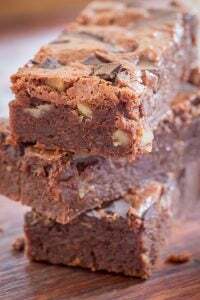 I have also been reading different recipes who promise that their brownies will be moist and chewy but, they would turn out dry or taste just like a cake. Your brownies look so moist and chewy that I can’t wait to try this recipe. Thank you for sharing your recipe! Hi Tonya, I sure hope you tried the recipe and loved it as much as we did! Thank you for your comment! Hi, can’t wait to make this recipe this weekend. Quick question, in the ingredients you said to use 1/2 cup of cream cheese and in the process you said 1/3 cup. How much exactly should we use? is it half a block of cream cheese or more in ounces? Hi Natasha, sorry about that – it’s 1/2 a cup of cream cheese or 1/2 a packet (4 oz).